This TeePee tent is a favorite among the brand's design team. Cardboard Box 2.0 is a new daring pop-up playhouse that is both sturdy and inviting for preschoolers. 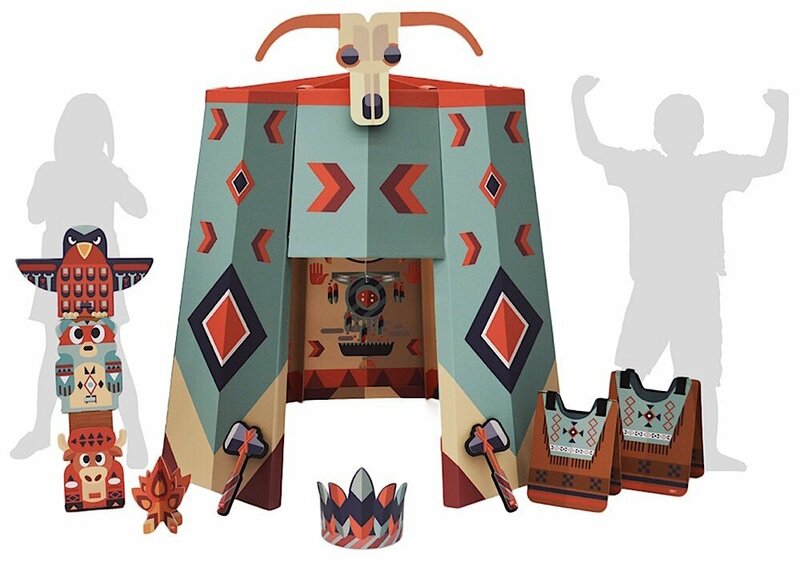 The brand is introducing Sharingland and five playhouse models that come ready-to-play with a hard-to-resist set of accessories to wear or play their “box.” Unfold in a minute a Grand Palace, The Epic Castle, Space Odyssey, Ancestral Teepee or Windmill Farm. Each Playhouse Kit retails for $99.99 and will soon be available in the U.S. online and in specialty shops. Reimagined for dotcom kids who are used to plugged-in gadgets, these playhouses unleash an adventure that is created on the spot. Interior interactive graphics and the enclosed wearables set off the make-believe adventure. 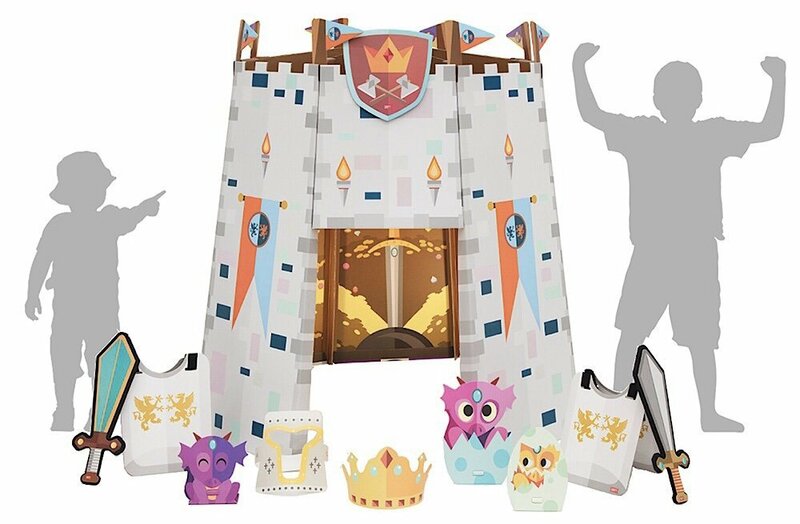 Each “kit” comes with characters and costume pieces such as a tiara, armor, fairy wings and tomahawks, depending on the Playhouse theme. These age-appropriate pieces enhance the Sharingland experience and promote interactivity. When play is done, unfold and store the flattened playhouse under the bed! Tomorrow, set it up and begin anew! Each of the five Playhouses (with more in the works) boasts 80% recycled and 100% recyclable materials that comply with the all-important CPSC safety requirements. Parents appreciate the easy-to-assemble and easy-to-store kits that sit flat in a closet, on a shelf or under a child’s bed. Monica Albarran, co-founder and general manager, recently discussed this fun line of playthings via an exclusive interview. 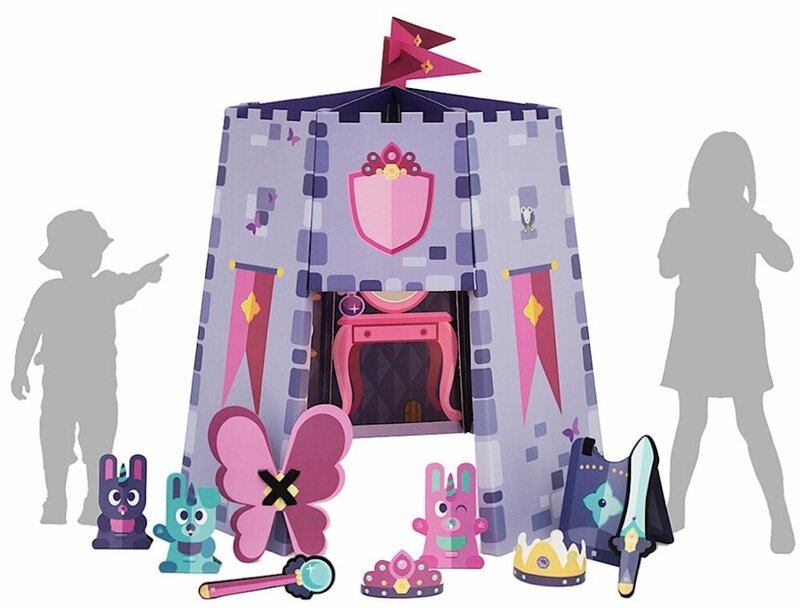 This fun “Princess Castle” is popular among little girls. Meagan Meehan (MM): SharingLand is a company that produces truly incredible, nearly life-sized, cardboard play sets for children. How did you initially come up with the idea for this company and its name? Monica Albarran (MA): It was a combination of things. On one hand, we’ve been in the cardboard solution industry for over 10 years, so using cardboard as the main material was natural for us, and on the other hand, when we became parents ourselves, we started understanding the importance of having quality time with our children. Not only being side by side playing games, but actually going through the wonderful world of imagination, pretend play and sharing. Thus, the idea was born. The name came from the idea of a utopic world or “land” where sharing is the core value, and the “sharing” in SharingLand doesn’t only refer to physical things, but sharing stories, values, strengths, ideas, different points of view and, ultimately, the world we all live in. MM: How did you settle on the themes for the five initial Playsets? Moreover, do you have a personal favorite and which had been most popular with kids? MA: To be honest, we started creating random themes! Then we started talking to many people during the developing process: parents, grandparents, teachers, specialists and mainly kids. But another important part has been observation itself and deep research. Kids are naturally drawn to themes that in the majority of the cases they’ve never seen with their own eyes, and the reason they love them is because they can use their imagination. They’ve heard stories about castles, knights and princesses; but also, they hear about outer space and technology. Very few kids have had the experience with America’s origins and even, as hard as it is to believe, many of them have never really interact with farm life. Settling was really hard, since we wanted to keep creating more and more themes. At the end, it made sense to have a small collection on the themes you know, as a fantasy/medieval land. The company’s favorite is the “Ancestral Teepee” in general, and the “Space Odyssey” is the most popular with kids. This cute Millhouse comes with farm animal cut-outs. 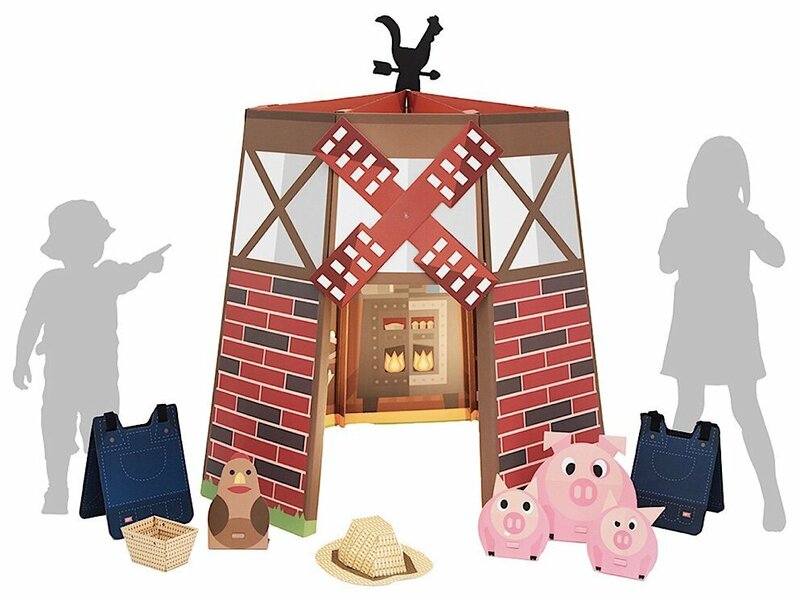 MM: The sets are incredibly detailed—the “Windmill Farm” even features an array of animals on both the outside and inside! Was it tough to get the design aspects of all of those things sorted out? MA: It surely was, we had to do a lot of research to find the correct animals and their looks, but it was incredibly fun as well. As adults we focus on the shopping experience, we read and understand the features of what a toy can do to kids. We believe that even though a parent will decide to buy our playhouses by its exterior, the magic for the kid will happen inside. Inside is where children spend most of their time creating their adventures, so we really took our time in the creation of the interior design and elements due to that aspect. You can probably imagine how different each child is from another, so it was a pretty big challenge to satisfy the vast majority of kids. We had to go for iconic content that dominates the commercial children’s market and bring some inspiration from Disney, Nickelodeon, Pixar and others, in order to create the tools for every child to spark their next exciting adventure. MM: The “Ancestral TeePee” is really astonishingly gorgeous and designed to be colorful and seemingly very authentic. Did you have input from Native Americans while you were designing this set? MA: We did a lot of research about the Native American tribes, their traditions, their colors, their symbols and locations, in order to understand them and be able to create the artwork, but we didn’t have much input from their actual community. We tried to create a mix of all Native American cultures, drawing most of our influence from the “paleo-americans” and all the way back to the post ice age. Our primary goal was to gather the vast array of elements to show the incredible value of all these cultures and hopefully inspire a new generation of kids on the importance of knowing where it all started. Once created, we did interact with some of them and they absolutely love it. MM: What was it like to get the prototype created and how similar (or different) is it to the final product? MA: As any good start-up, the first sketch ever was drawn in a napkin! Our first prototype was a white cardboard structure with our iconic geometric shape. Graphically, our sketches turned into digitized designs which were then decomposed to find the right colors, shapes and styles and put them into the blank space. Our final product did undergo significant changes, maybe more than 30, as we have been carefully adding value to the product with additional characters, accessories and other objects to play with, in order to magnify the overall experience. We are still creating new and better versions of our products, to satisfy important customer needs, so this is an ongoing challenge that will be present forever. MM: What were the challenges of getting the game produced and do you plan to stay independent or would you like to sell the series to a well-known company? MA: As we mentioned, we have been in the cardboard solution industry for many years and we have some old tricks under our sleeve. Even though there were and still are a lot of challenges in the production process, it was not as burdensome as for other types of toys. We own the whole process, from the ideation, picking the right materials (all of our products come from at least 80% recycled materials and all of them are 100% recyclable), graphic and industrial design, and all the way to printing, producing, assembling and distributing, so we have the good fortune to control our results. Our people are amazing, really creative and they thrive at making things work. This helps our process to be smooth and optimal, plus, very importantly, environmentally friendly. We did have, however, a lot of challenges in the commercial side of things, as we had to be very careful with the toy industry’s “do’s and don’ts”, safety issues, well written instructions and other details like these. The most relevant challenge will be to guarantee the continuous and consistent creation of high impacting products, while maintaining incredible quality and respecting the ideals and values we have in SharingLand. For now, we want to consolidate as an independent company. In the future, we are totally open to evaluate any options, as our main goal is to promote play, imagination and connection through sharing. If a big player wants to help us do that, totally welcome! 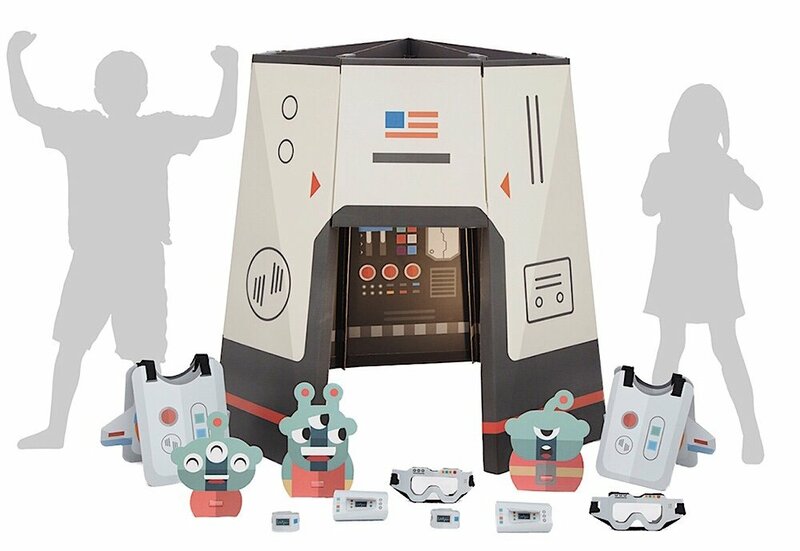 This spaceship/rocket box comes with little cut-out aliens. MM: What experiences with fans have been most memorable to you and why? MA: There are so many incredible experiences that are memorable. It would be almost impossible to remember them all, but we do have some favorites: The wow expressions of kids at the moment they open the package, look at the wearables and immediately start building their own story, even if the playhouse is not ready yet, that is just so cool. The satisfaction we see in the parents’ faces and even in a 95-year-old grandpa, when they realize they can assemble the playhouse in just minutes, even when they thought they couldn’t. The amazing things that happen between children when they are totally immersed in their own imagination and they share their stories and values and you are able to see it. A little boy once said to another: You stay in the spaceship, I will go out. You are too important for this mission. I will take the risk for you. OMG! In general, we love absolutely every smile, every laugh, every time that anyone has rejoiced from using our products, and even more when they thank our team for their work, because that means we are doing things the right way. MM: Overall, what are your biggest goals for the future of “SharingLand” and are you planning any other themes at the moment? If so, can you tell us any details? MA: Our biggest goal is to establish our SharingLand as the brand of play, imagination and connection through sharing. We want to create quality time for kids and their families and friends, memorable moments of play and amazing experiences overall. We want to promote educational motifs and help parents to tackle some of the pains of modern parenting. We know technology is getting broader and wider, but we want every kid in the planet to enjoy some of the simplest and greatest joys in life: playing using your imagination, sharing moments and experiences with the people you love and just having good old-fashioned fun through a pretend play day. Lots of new products and surprises coming for 2019. Thanks for sharing! The Sharingland Tents are on sale at Grommet, Uncommon Goods, Sharingland.com, and soon on Amazon. This traditional castle set comes with little dragons. This TeePee tent is a favorite among the brand’s design team.